When he reached the Heaven of the Four Great Kings, he asked all the gods this question. None of them knew the answer. “Perhaps u can ask the Four Great Kings”, they suggested. So the monk asked the Kings, but none of them knew the answer too. So they suggested, “Perhaps u can ask the 32 Gods in the higher heaven”. The monk went back to earth and he meditated once again. With great effort, he succeeded in transporting himself to the second heaven, the Heaven of the 32 Gods. There he asked the gods his profound question. None of them knew the answer. “Perhaps you can ask King Sakka, the King of the 32 Gods”, they suggested. So the monk asked the King, but He didn’t know the answer too. He suggested, “Perhaps you can ask the Yammas in the higher heaven”. The monk when back to earth again and meditated, till he was able to transport himself to the Heaven of the Yammas. Again, none of the gods there knew the answer. So he went to the higher heaven. This went on until the monk reached the highest of all Heavens, the Heavens of the Brahmas, the Supreme gods. There the monk asked the Brahmas, but none of them knew the answer. “Perhaps you can ask Great Brahma, the Creator, the Un-created, the Knower of All, …..etc…..”, the Brahmas suggested. The moment Great Brahma’s name was spoken, He appeared with all His glory. “I am the Great Brahma, the Creator, the Un-created, the Knower of All, …..etc…..”, Great Brahma spoke. Thrilled at the sight of Great Brahma, the monk asked his profound question, “Where does the four great elements cease without remainder?”. This time, the monk was very frustrated. He asked for the 3rd time, “Yes, I KNOW you are the Great Brahma, but I came to ask this question, Where does the four great elements cease without remainder?”. This time, Great Brahma did not say anything. He took the monk in the hand and, with all His glory, appeared in a far end of existence. Great Brahma then spoke, “Monk, you see all these gods there? They all think I know everything. Are you trying to embarrass me in front of all these gods?”. The monk was taken aback, “But Venerable Sir, if you do not know the answer, who would?”. “You fool!”, the God shouted, “The Buddha is on earth. Why don’t you ask him and stop bothering me?”. The monk then went back to earth and asked the Buddha. The Buddha laughed at his little adventure and told a joke about it. “Monk, in the old days, navigators depended on birds to know if land is nearby. They would release a bird. If the bird returned, it means that land is not near. You monk, your just like that bird. Flying away from the ship, seeing no land, and then returning to me”. The monk was so amused he too laughed. 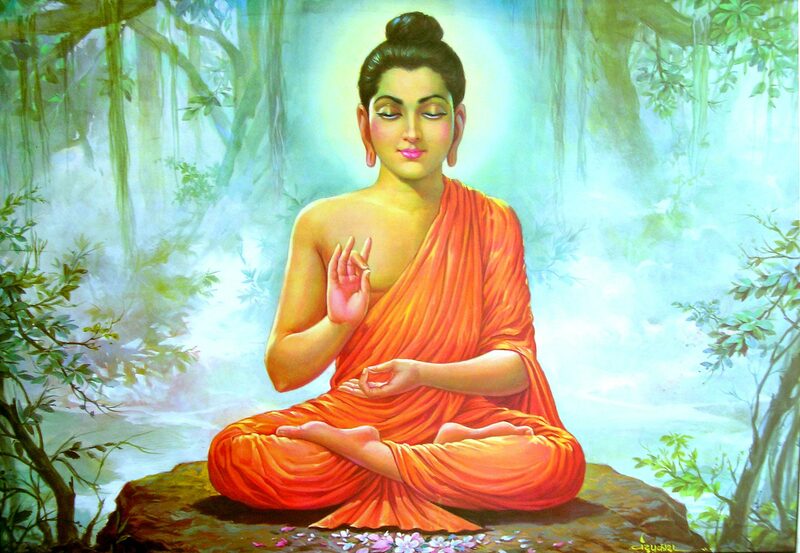 At this point, the Buddha gave the answer, “Nirvana is when the four great elements cease without remainder”. The monk understood. He rejoiced at the answer.